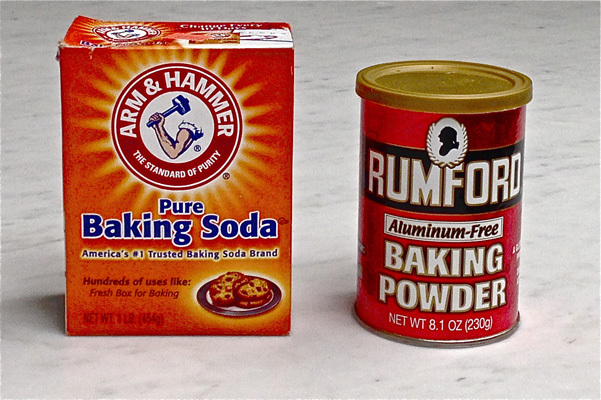 The similar names and appearance of baking soda and baking powder make them difficult to differentiate. There are often added to the same recipe, but they are chemically different, so you should know the things that make them dissimilar. Baking soda is also known as bicarbonate of soda or sodium bicarbonate, and it is a base mineral which creates carbon dioxide when mixed with acidic ingredients. Hence, when added to recipes, you will also need something acidic, like yogurt, buttermilk, lemon juice, brown sugar, molasses, or cream of tartar. It is much stronger than baking powder, so I not neutralizes, it gives a metallic taste. This is a good rule of thumb: add 1/4 teaspoon of baking soda per 1 cup of flour in a recipe. Baking powder is a combination of various acids, including baking soda, cornstarch, and cream of tartar. While cooking, the first leavening occurs when baking powder gets wet, and the next one when the baking powder is heated. The following rule is a great rule of thumb: add a teaspoon f baking powder per 1 cup of flour in a recipe. Some recipes involve the use of both, baking powder and baking soda, and the reason for this is the maintenance of balance, as the carbon dioxide created from baking soda and certain acid does not leaven the volume. You should note that they both have expiration dates, so you should use them fresh, and change them at least every three months. If you want to test baking soda, pour 3 tablespoons of white distilled vinegar into a small bowl, add half a teaspoon of baking soda, and stir. The baking soda is fresh if the mixture quickly bubbles.